The following post contains SPOILERS for The Avengers and Guardians Of The Galaxy. Finally, after years of build-up, here he is: Thanos. The Mad Titan. The Avatar Of Death. The baddest dude in the universe. Introduced in a post-credits scene in The Avengers, his arrival has been teased, directly or indirectly, ever since. In Guardians Of The Galaxy he appears at last in the purple flesh. And… he does absolutely nothing. He sits on a throne in space in a vaguely ridiculous outfit. He gives his henchman a few orders. And then he vanishes from the movie completely. I guess he had more important things to do. He’ll be back, though. The entire Marvel Cinematic Universe is building to a confrontation with Thanos. He is searching for these mythic objects of immense power, the Infinity Stones, and eventually (probably around the time of Avengers 3) he’ll become too powerful to ignore. But that’s several movies and years away. In the meantime, we are stuck with these teases, which are becoming so tiresome they’re beginning to undermine Thanos’ credibility as a legitimate threat before he even gets going. The guy hasn’t done anything yet, and I’m already kind of sick of him. Ryan is exaggerating slightly—Thanos didn’t appear onscreen until Marvel movie No. 6, The Avengers, and the first Infinity Stone didn’t show up until movie #No. 5, Captain America—but his point is still a good one. 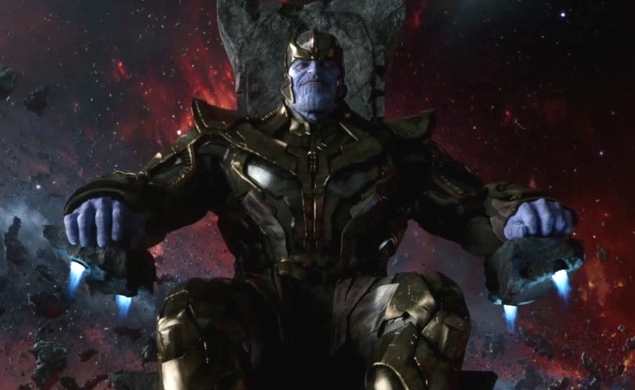 Thanos is the supposedly king of the supervillains. He has immensely powerful lackies like Loki, an actual god, and Ronan The Accuser, who can wipe out entire planets. He commands armies of warring aliens and giant flying space slugs. But so far, he’s been completely ineffectual. Isn’t the title of “supervillain” supposed to denote someone is super-effective at being a villain? I’ve met gassy toddlers who wreaked havoc more efficiently than Thanos. The character’s defenders say that his success rate is not what matters, because he’s supposed to fill the same role as the Emperor in the original Star Wars trilogy: a vaguely defined presence who gives marching orders to mid-level baddies like Darth Vader. But think of how much the Emperor accomplished (through Vader) in just his first film, The Empire Strikes Back. He destroyed the Rebel base on the ice planet Hoth, lopped off Luke’s hand, and encased Han Solo in carbonite. That’s a damn good day’s work for a bad guy. The heroes aren’t entirely defeated, but they’re certainly left reeling. In a sense, Thanos has accomplished more good deeds—helping heroes overcome their differences and learning to work together as a team—than bad ones. His master plan better explain why he wanted to create all these groups to stand against him, otherwise he’s officially a dope. At this point, a better comparison for Thanos than Emperor Palpatine is Dr. Claw, the shadowy puppet master from the Inspector Gadget cartoon, who spent the entire series ordering people around while he sat in a chair, and was repeatedly outsmarted by a little girl and her dog. Thanos even kind of sounds like Dr. Claw. Thanos’ incompetence wouldn’t be so problematic if every Marvel villain besides Loki wasn’t a complete and total dud. From Iron Monger to Abomination to Whiplash to Ronan The Accuser to the guy from Thor: The Dark World whose name I couldn’t even remember until I looked it up on Wikipedia just now (it’s Malekith), they’re all interchangeably generic evildoers with interchangeably generic evil plans. The glimpses of Thanos are used to paper over their blandness with the promise of excitement down the road. These bad guys might be bad, they insist, but just hang in there; this purple guy will be really nasty.